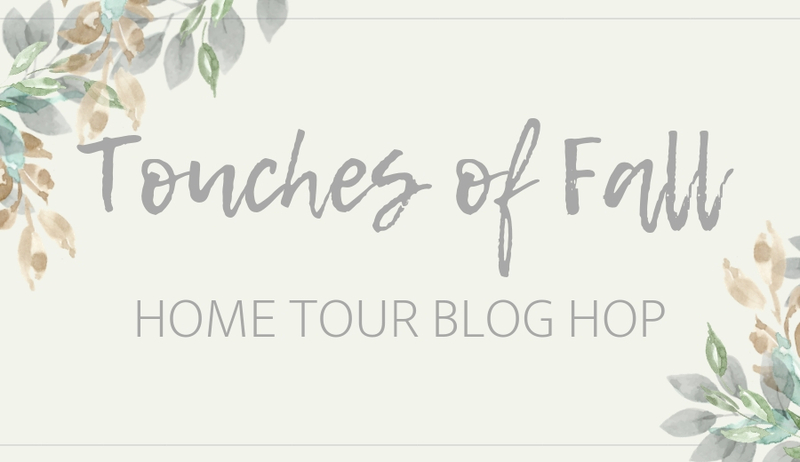 This year my fall decor has a pumpkin patch theme and it’s just one stop on a “Touches of Fall” home fall decor tour with 5 other bloggers! Bring on sweater weather, football, cute booties, and all that fall decor! Oh and Pumpkin Spice Lattes too. It’s feeling like fall at my house with pumpkins in every corner. 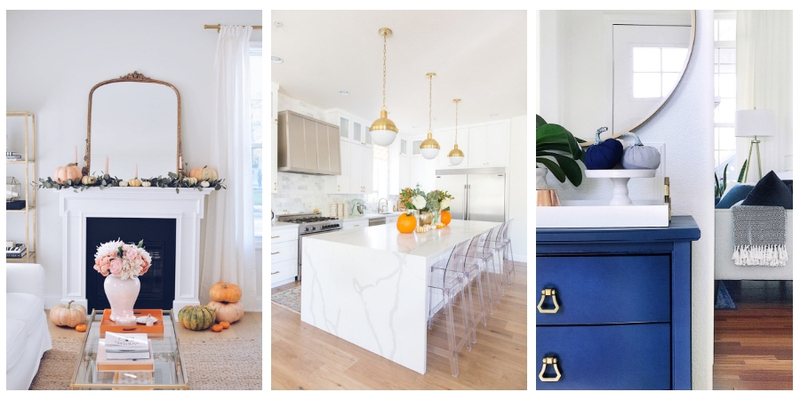 Let’s take a stroll through to see all of the fun pumpkins not only at my house, but linked below is a GORGEOUS fall home decor tour with some of my favorite bloggers! Pumpkins are the easiest fall decor because they are affordable and can be matched to anyone’s home decor. 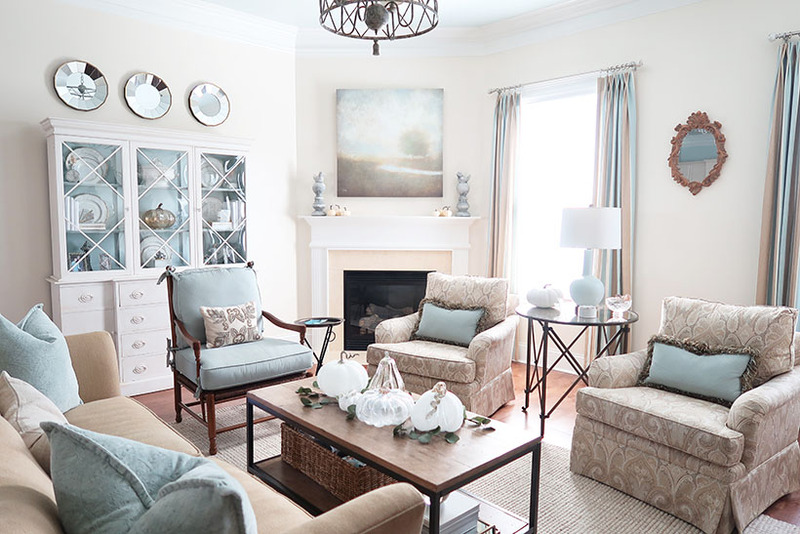 In my home pale blue and cream rule, so it was fun to find complementary colors. Guess what burnt orange, eucalyptus green, and faded fall hydrangeas look great with pale blue and cream! 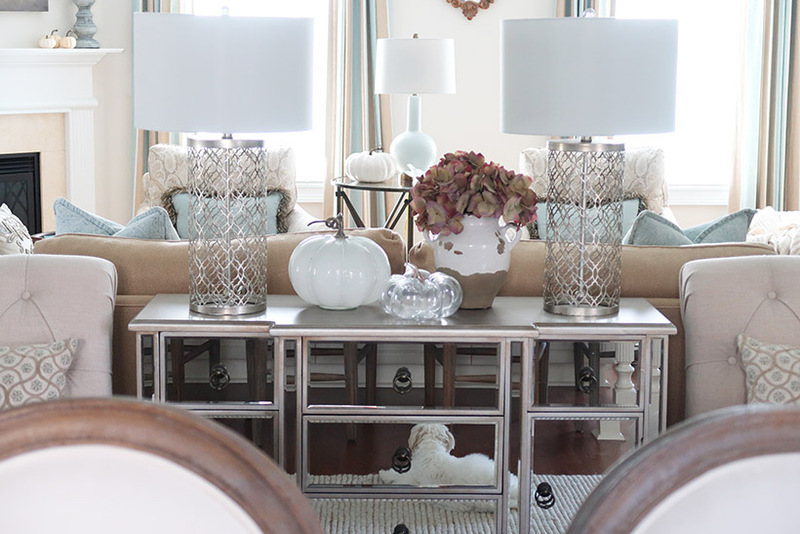 My goal was a neutral and sophisticated fall decor look that can blend easily with my day to day decor. It started with a gold glass pumpkin at Home Goods and the fall theme of a pumpkin patch was born 🙂 Literally, this one pumpkin inspired the rest of my fall home decor and my new love for glass pumpkins. I’ll be collecting them every year now. Pier One has the most amazing and affordable glass pumpkin collections and everything is on sale! I also found some interesting pumpkins at Pottery Barn too. 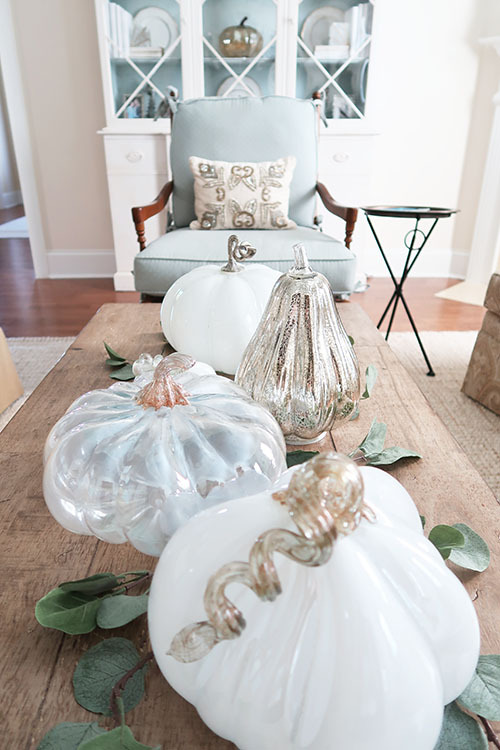 For your own home, neutral glass pumpkins are such an easy way to add a touch of fall. 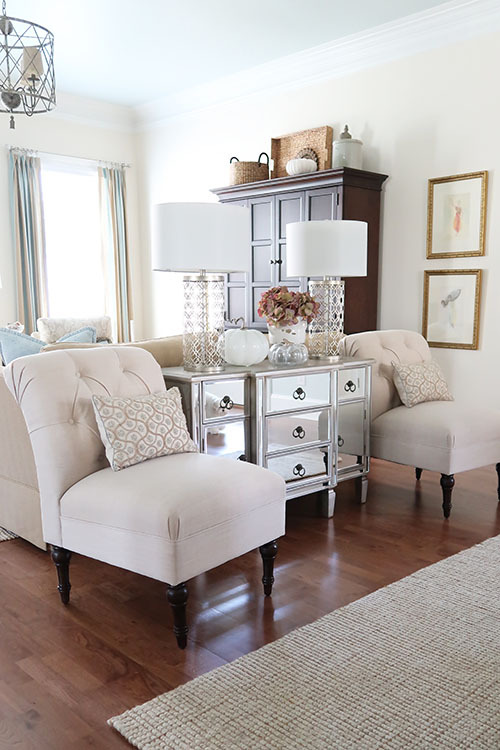 They can be put out right when the fall season starts and can live within your regular home decor, until it is time to decorate for Christmas or Winter. 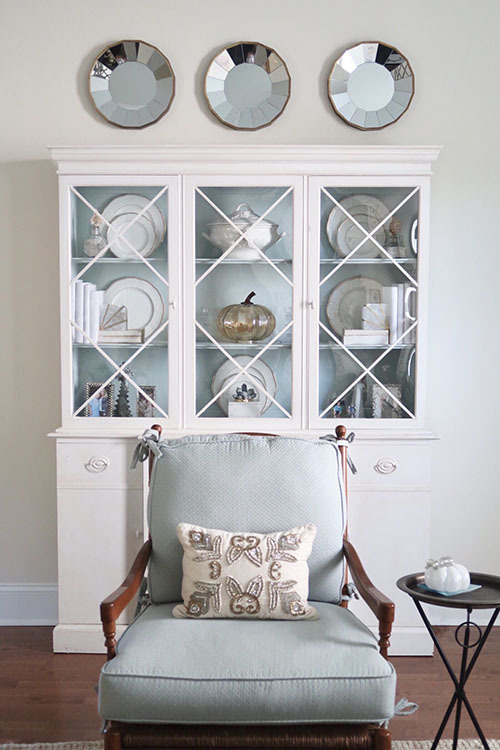 During this home tour you will see how I use them in various ways around my home – the same ones! I wanted to show you how versatile a few glass pumpkins can be. Group an uneven number together on any table and you’ve got yourself a pumpkin patch. 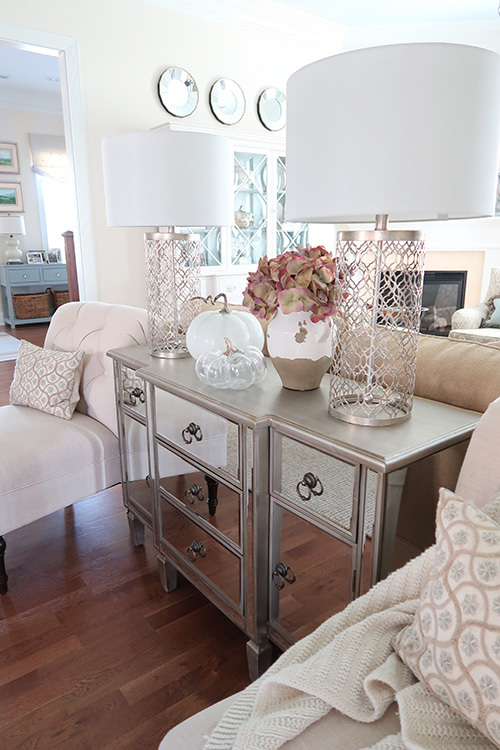 Here I am showing you how I placed them on my family room coffee table. 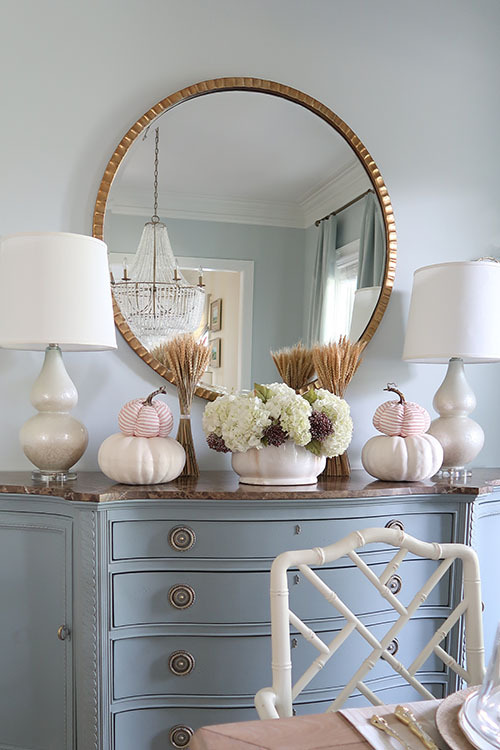 Then placed white faux pumpkins in place of my regular accessories, for the full fall home decor effect. With some inexpensive eucalyptus leaves, I created a little pumpkin patch! Using a few stems that I cut into smaller pieces I just tucked them under all of the glass gourds to make it look like they were growing on a vine. 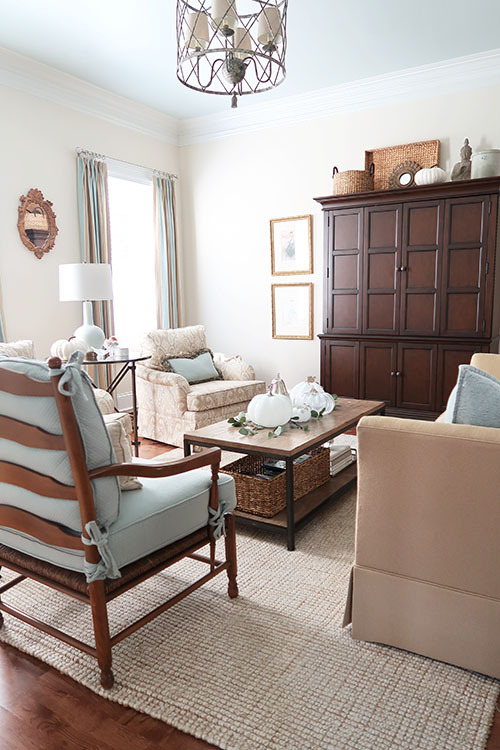 Since my sitting area backs up to the family room, I wanted to add some fun fall accessories there too. It’s Mick spot and he deserves fall decor to enjoy! Pottery Barn had these amazing fall colored hydrangea stems and it gave me to buy a rustic jar I’ve been coveting to match the one in my kitchen. The jar is SO versatile that I will move it around my home season to season with both fresh and faux floral stems. I used three hydrangea stems and it filled the jar perfectly! By the way, this is the BEST runner and the family room has the matching rug. It’s been through every wear and tear imaginable since I moved in 8 years ago. 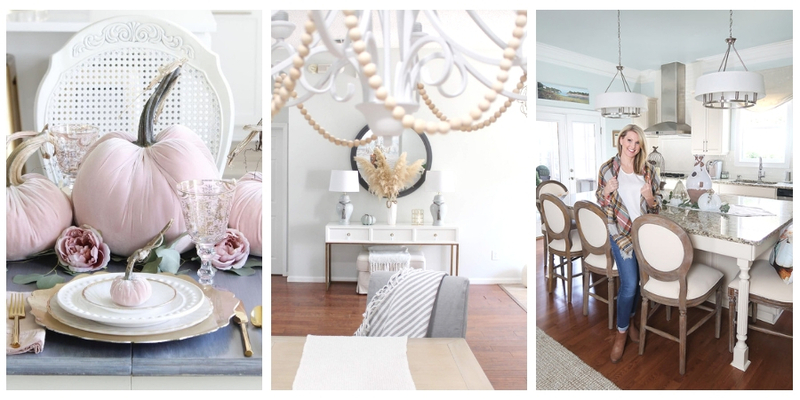 It’s the perfect neutral backdrop and soft on the feet! The white pumpkin with the silver stem came from Home Goods. Pretty much my island is the kitchen! 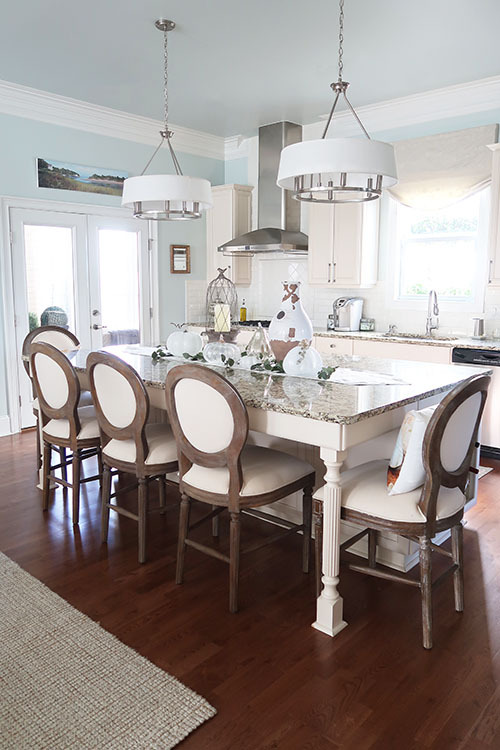 It’s huge at 8 ft x 5 ft, so I tried out the same arrangement on my family room coffee table on the island. The kitchen is where the fall feeling really happens. I love my pumpkin spice creamer every morning! 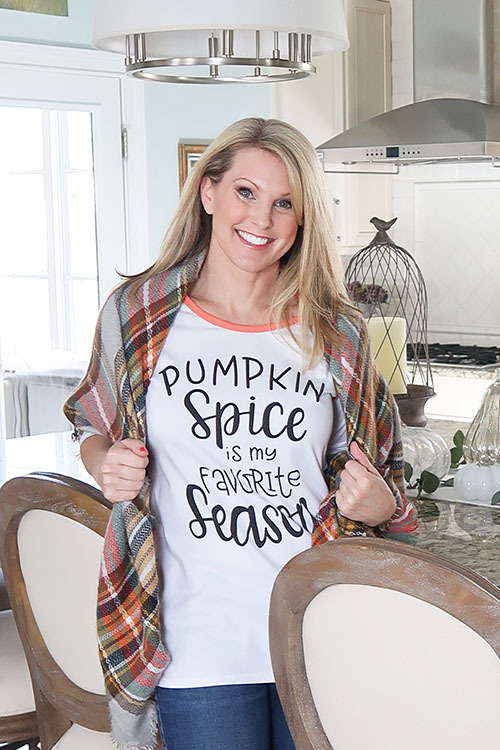 Yes, I may be a bit obsessed with everything pumpkin spice because I just had to have this t-shirt and you bet I’ll be wearing it every chance I get. This year I have an entirely new dining room! If you missed the before and after, it was quite a change going from a round table to this nice rectangular table. Now I have more space to decorate – yay! 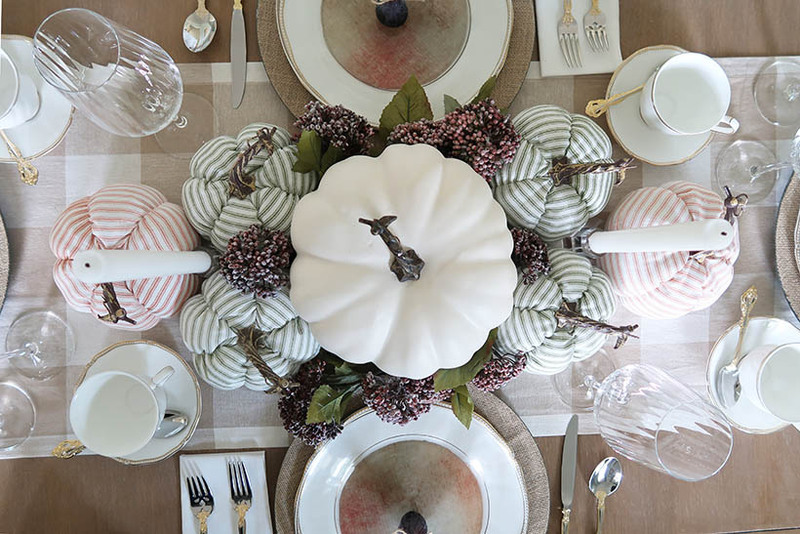 Layers and layers of fun stuffed pumpkins in a ticking stripe, stems in shades of berries, a neutral buffalo check and bam I have a whole new look! Plus I made these fun new plates that set the color palette. Read this easy tutorial on how to make tissue paper plates that are only $5 a piece! 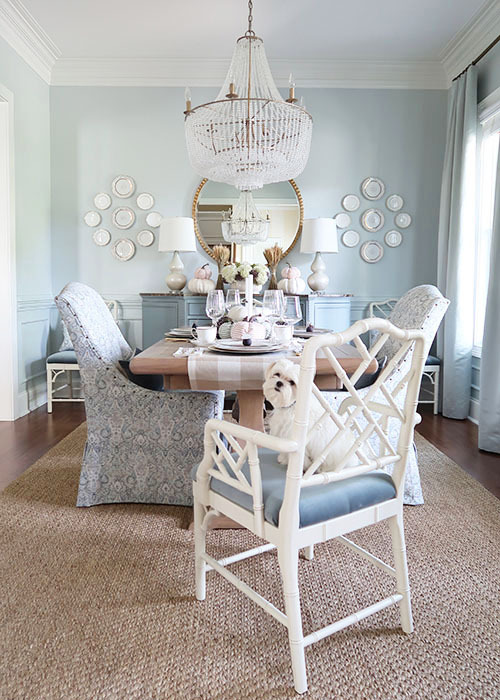 I love the casual and more formal plates layered, with accents of gold. 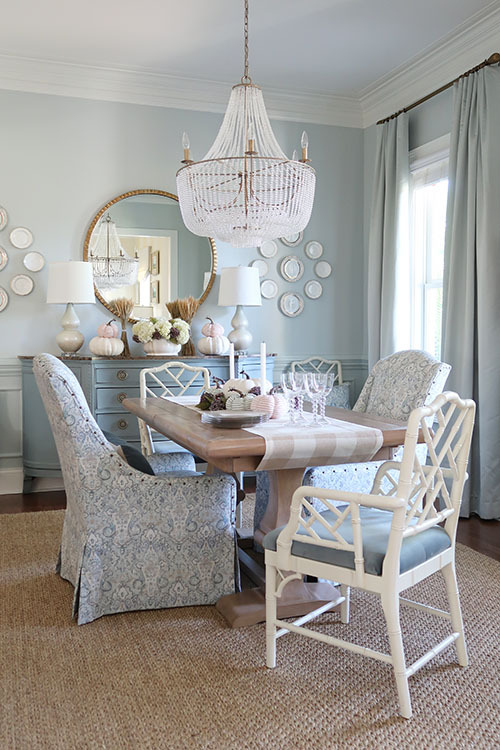 The burlap chargers were the BEST find adding another layer of texture and visual interest. Then to enhance the berry coloring, I used figs straight from the grocery store for a unique name placard. 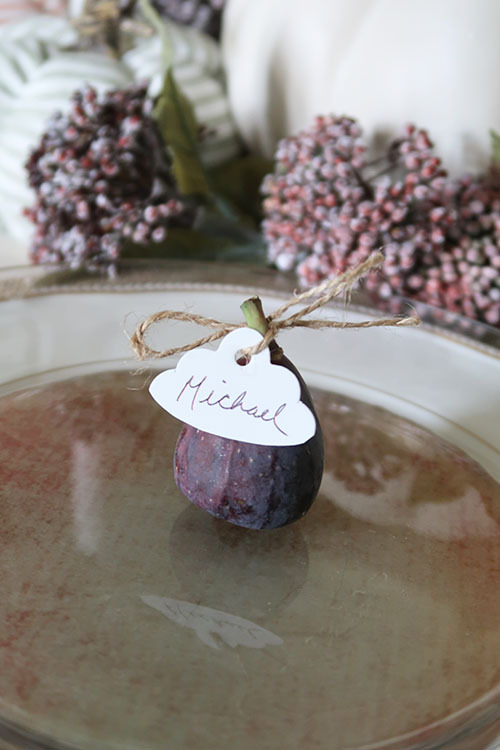 Any edible fig name card – yes! Then for a very french country feel, I bought sheaves of wheat and tied them together with string for a fall decor accent that is reminiscent of the harvest. They are a very inexpensive way to enhance your fall decor and can be re-used every year in new ways. Sorry, the ticking striped pumpkins were from Hobby Lobby and no longer available. I found something similar on Etsy linked above. Fresh white hydrangeas from the grocery store were combined with faux stems for a whole new look! 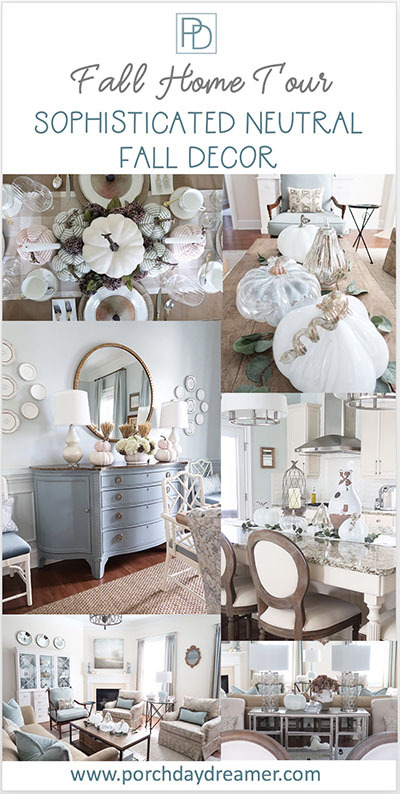 I’m loving the looked of stacking fabric pumpkins on faux white pumpkins this year! 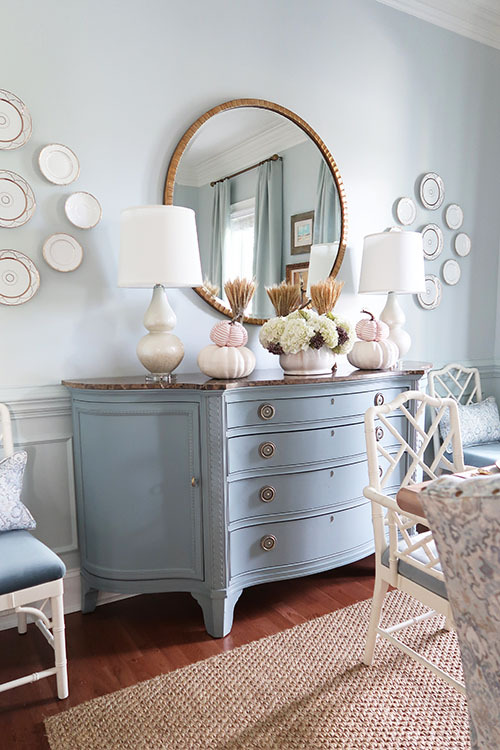 If you want to know how I painted the credenza to get this beautiful french blue, I’ve written an entire tutorial. It wouldn’t be fall without a little fun sitting by the fire pit. 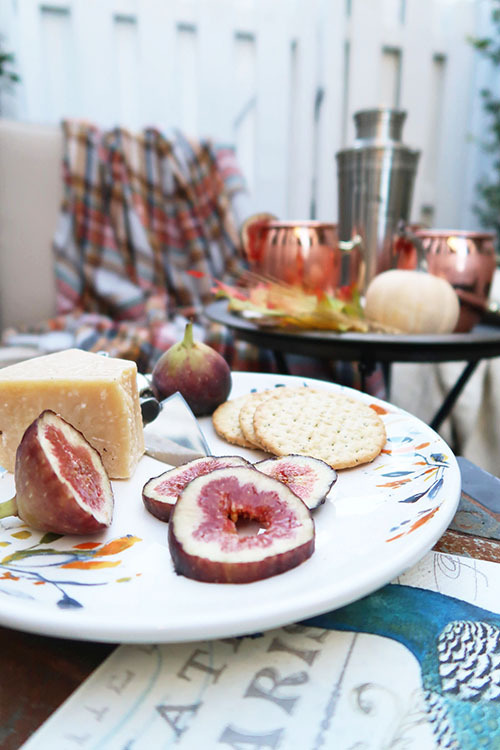 How about after dinner using those figs for a delicious Fig Moscow Mule recipe? 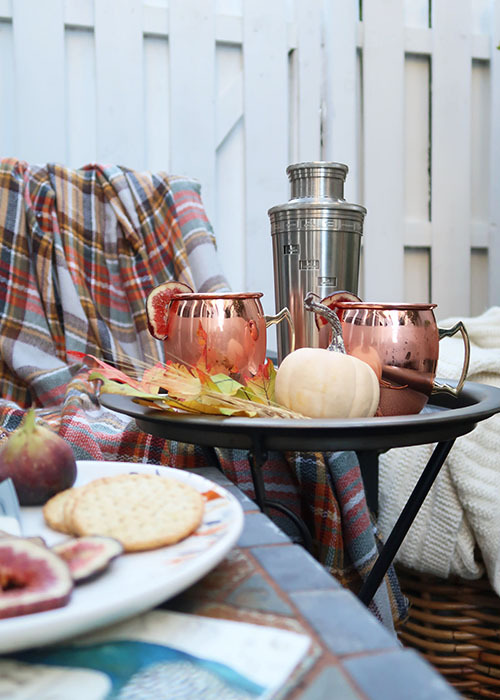 Why are Moscow Mules served in copper mugs? They keep the drink extra cold and up the cold sensation on your lips! Some say real copper mugs intensify the flavor. I’m going for really cold to create a really refreshing drink! In a shaker filled 1/2 way with ice, combine the vodka, lime juice, and a couple of slices of fig fruit chopped and shake. Throw in a couple of shots of vodka, squeeze a half of lime into the shaker, throw in a couple of mushed slices of fig fruit into the shaker of ice. Do a little dance and shake, shake, shake away! If you are fancy like me, add garnish of sliced fig or lime! Are you getting that FALL feeling now? Not yet? Well, I have MORE inspiration for you! 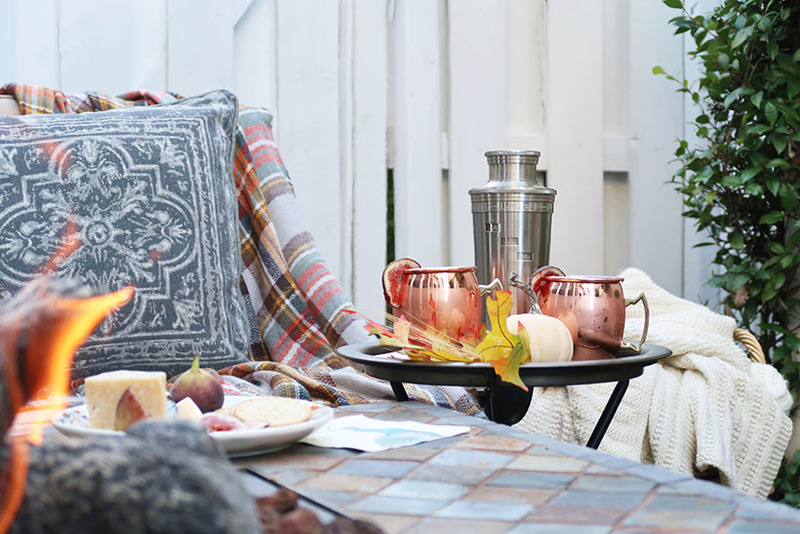 First, check out my post all about easy ways and inexpensive products for fall decorating. 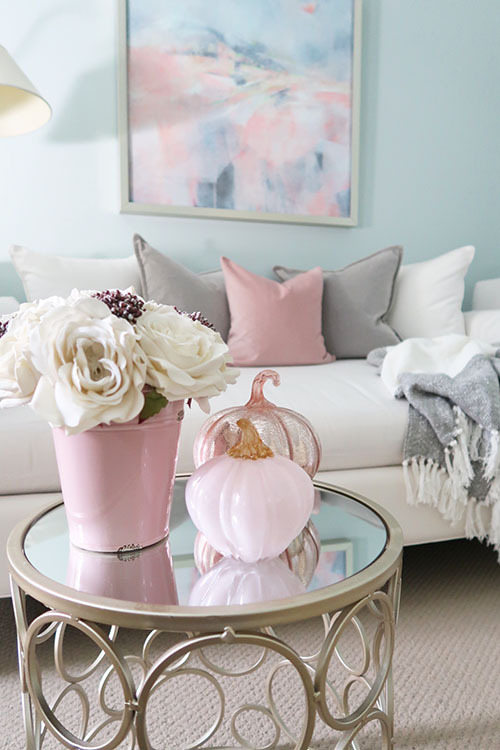 Plus I’ve recently updated my master bedroom for fall in blush and gray, read all about it! Please consider signing up for my weekly email, so you never miss a post. 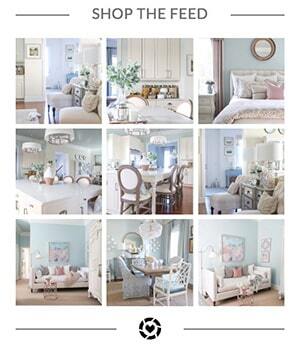 Next week I’ll be revealing the transition of my bedroom from summer to fall. It’s SO beautiful – you won’t want to miss it! The Fig Moscow Mule is YUMMY! I made them for my mom and me last Thanksgiving 😉 Thank you so much for including me! Hi Tracey. 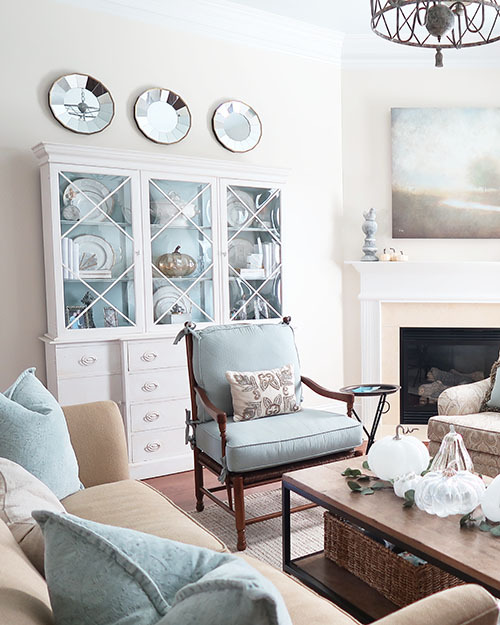 I love your house – so classy yet comfortable. 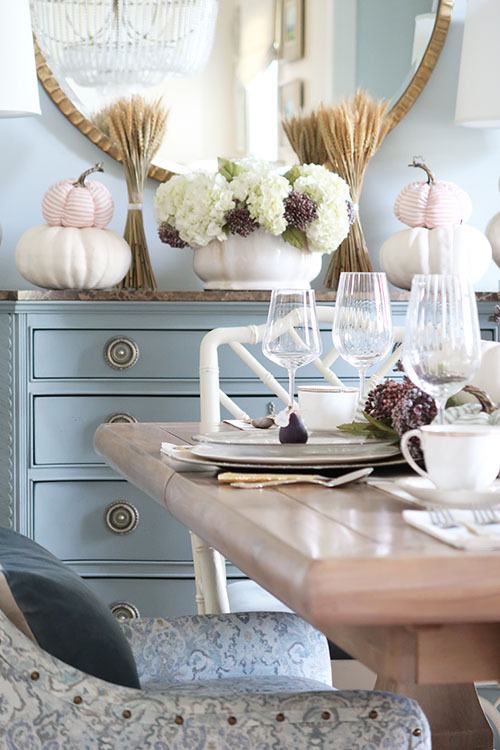 Your fall decor sets everything off so well, and I’m inspired to get some pumpkin decor going at our house. I can’t believe that you have only been blogging for a year (and I think I have been following you since the beginning). You’ve gotten SO MUCH accomplished in that time, seemingly by your little-old self that you inspire me to try things on my own as well. 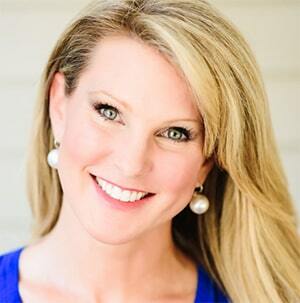 Wow, Tracey! 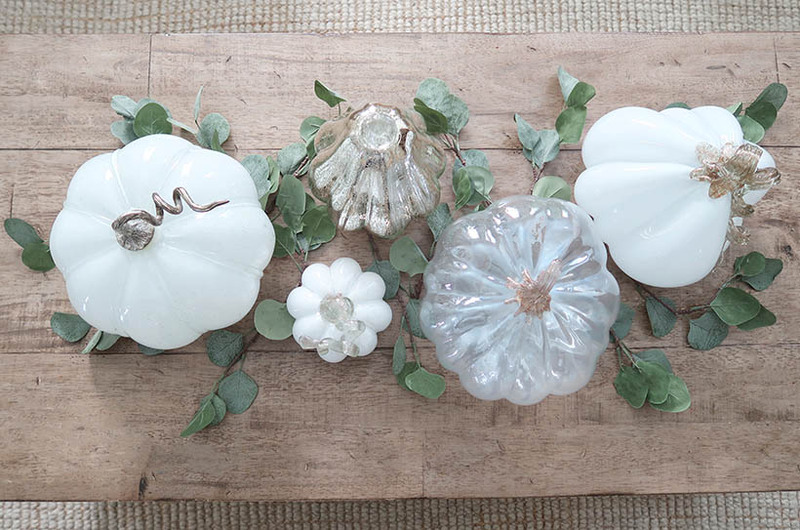 You have found the prettiest glass pumpkins and everything is so elegant and beautiful! 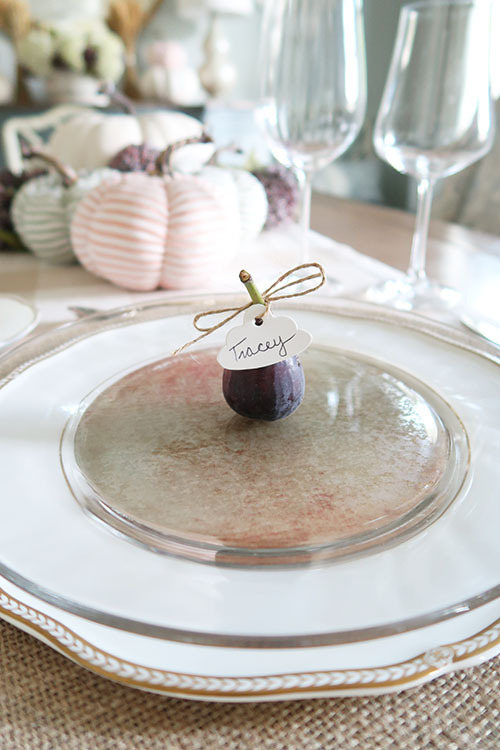 I love your approach to fall and I really love those fig name cards! So darling! And Omgosh I need that shirt! You’re a doll!!!! Oh thank you SO much for your compliments – it means so much to me! It’s my first time decorating for fall and finding those glass pumpkins made it a fun project. 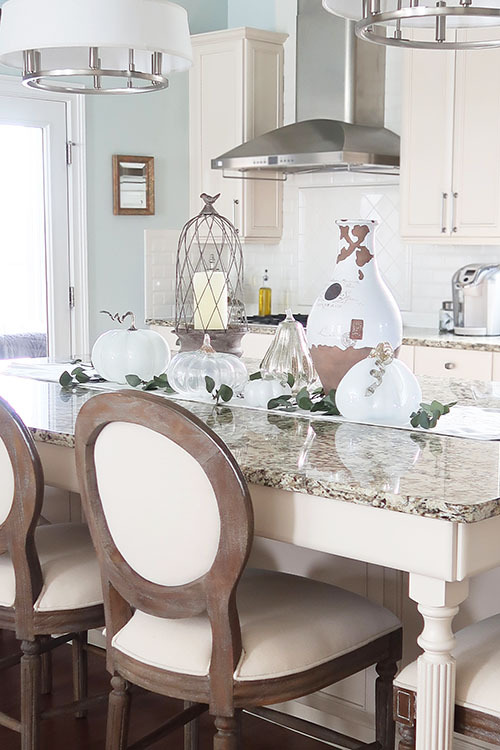 Tracey, your home looks gorgeous all dressed up for fall! 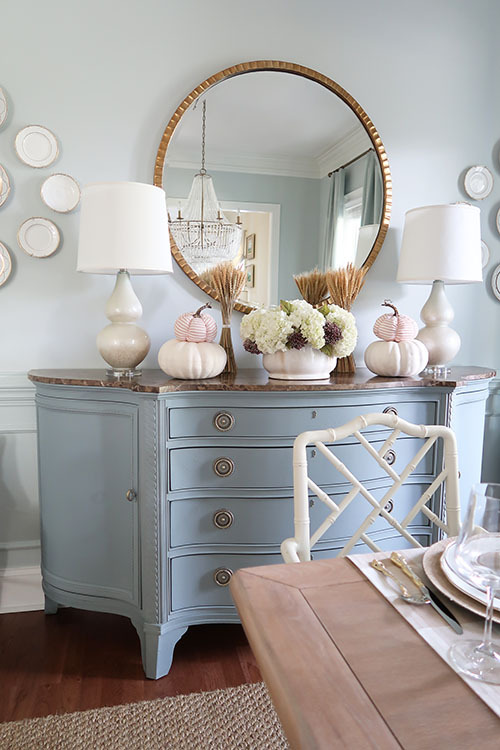 I love your color palette and those adorable ticking pumpkins! Happy Fall! Thanks, Shelley you are SO sweet. I noticed you had the same orange velvet pumpkin I have on my porch from Hobby Lobby. I love those little pumpkins! Glad I grabbed the ticking striped version early this year! Happy fall!